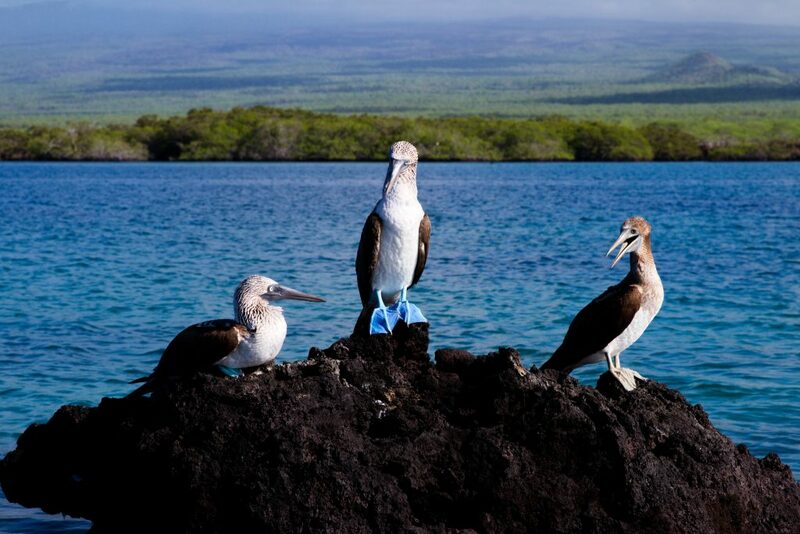 Many travelers venture to the Galapagos in search of the famous blue-footed booby. I was no exception. I couldn’t wait to see the bright blue feet I’d only seen in photos. We spent the morning riding our panga through mangroves on the island of Isabela, and I thought that perhaps my best moment of the day was realized when we watched several spotted eagle rays swimming together in the shallow waters. However, the blue-footed boobies were not to be outdone and we were all in for a surprise. Our NatHab guide, Santiago, was alerted that there may be some blue-footed boobies diving for fish in the open water outside of the mangroves. By the time our panga made it out of the mangroves, there were no boobies to be seen. We continued on around the island enjoying the beautiful scenery and iconic wildlife when suddenly, Santiago spotted an amazing sight. Our panga sped towards the magnificent show. We all watched in awe as blue-footed boobies swarmed the sky and repeatedly dove into the water—tucking their wings at their sides like tiny torpedoes. The scene looked chaotic, but as Santiago explained, it was actually quite organized. A leader booby spots a school of fish and signals to all of the other birds that they will dive together to feed. Santiago said we were lucky to see such a display, as this is not a typical privilege that most Galapagos travelers enjoy. It was a memorable wildlife moment on this trip through the islands, and I’m thankful that in that moment, all of those blue-footed boobies were ready for lunch.